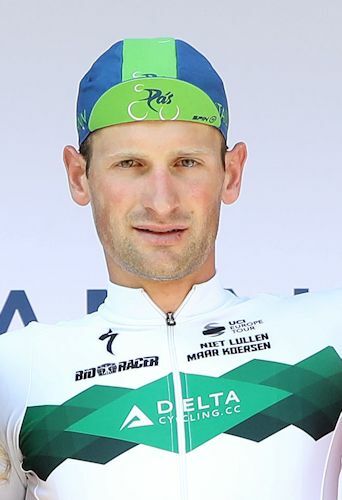 He is from a famous cycling family and said he was delighted to land the victory for his father Mick, a former international, his uncle Ciaran, who is now Cycling Ireland president, and others who had helped him during his years racing. The undulating stage from Mitchelstown had been marked by a breakaway group initially comprising eight riders, namely Marc Potts (Ireland National Team), Russell Downing (Ireland Holdsworth Pro Racing Team), Andrew Turner (Britain Team KTM), Fintan Ryan (Cycling Leinster), Philip Lavery (Cork STRATA 3 - VeloRevolution Cycling Team), Seán O'Malley (Galway Gerry McVeigh Cars - DoorMotion), Ulises Alfredo Castillo Soto (USA Jell Belly p/b Maxxis) and James Tillett (Wales Racing Academy - National Team). Of these, Downing, Lavery, Potts, Castillo Sotto and Ryan were still in front inside the final ten kilometres, but were caught with less than three kilometres to go. Mexican rider Castillo Sotto had the considerable consolation of taking over leadership in the King of the Mountains contest, thanks to his impressive clean sweep of the primes on the day’s five climbs. Overnight leader Cyrille Thiery finished in the same time as McKenna and retains his overall lead. He stays ten seconds clear of Bugter, 11 ahead of Shaw and 13 up on Robbe Ghys (Belgian National Team), who is also the best young rider. Cigala’s sixth place saw him take the best county rider award yet again. He said that he was caught out by Shaw’s tactics. “I think the Holdsworth guys had three or four in the finish. One of them [Shaw] let the wheel go. When I saw that gap, I couldn’t really chase it down myself. Ghys remains best young rider, Ronan McLaughlin (Westmeath Viner-Caremark - Pactimo) is the best overall county rider and Raymond Cullen (Tipperary Panduit) is the best category two competitor. 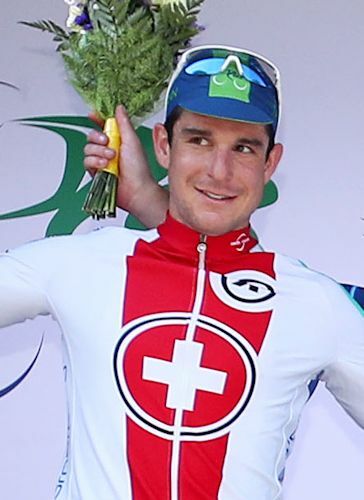 Thiery’s Switzerland National Team is best of the squads, while Westmeath Viner – Caremark – Pactimo is best Irish county team. Stage six covered 154.6 kilometres from Mitchelstown to Carlow and had five categorised climbs en route. These all came in the final 50 kilometres, and were that of Byrnesgrove (category 3, km 108.7), Castlecomer (category 3, km 116.3), the first category wall of Gorteen (km 120.9), plus the second category pair of Coan West (km 124.6) and Clongrennan (km 133.5). There were several attacks in the early kilometres but it took 18 kilometres for something to stick. A dozen riders built an eight second lead, prompting too others to set off in pursuit. The gap from break to bunch grew to 20 seconds but, after 21 kilometres, those two chasers were caught and the peloton was 15 seconds back. The gap inched up to 23 seconds as the race reached Cahir (km 25.5). The riders present were Darnell Moore (Ireland National Team), Conn McDunphy (Ireland Holdsworth Pro Racing Team), Matthew Nowell (Britain Canyon Eisberg), Callum Ferguson (Britain Team KTM), Sjoerd Bax (Netherlands Delta Cycling X), Thery Schir (Switzerland National Team), Curtis White (USA Jelly Belly P/B Maxxis), William Roberts (Wales Racing Academy - National Team) . Declan Egan (Antrim Velo Cafe Magasin PowerHouse Sport), Stephen Murray (Cork STRATA 3 - VeloRevolution Cycling Team), Adam Stenson (Dublin Team Gerard DHL) and Eugene Moriarty (Kerry Tralee Manor West). Maximilian Stedman (Britain Canyon Eisberg) bridged across after 34 kilometres of racing, making it 13 out front entering New Inn (km 35.2). However the bunch was very close and reeled in the break a minute later. The peloton remained together through Cashel (km 44). Several kilometres later, a group of six riders moved clear, namely, Marc Potts (Ireland National Team), Russell Downing (Ireland Holdsworth Pro Racing Team), Andrew Turner (Britain Team KTM), Fintan Ryan (Cycling Leinster), Philip Lavery (Cork STRATA 3 - VeloRevolution Cycling Team) and Seán O'Malley (Galway Gerry McVeigh Cars - DoorMotion). They were 12 seconds clear with 55 kilometres covered. Ulises Alfredo Castillo Soto (USA Jell Belly p/b Maxxis) and James Tillett (Wales Racing Academy - National Team) were chasing at eight seconds, with the main field at 17 seconds. One kilometres later, the two chasers joined up to make it eight out front. Soon afterwards, David Brennan (Mayo Castlebar Unit 7) and Matthew Sparrow (Tipperary Panduit) started chasing. They were 55 seconds back at kilometre 60, and just ahead of the peloton. Timothy Mitchell (USA CCB Foundation - Sicleri) jumped across to them. The peloton then turned off its efforts. At kilometre 62, the eight leaders were 55 seconds ahead of the three chasers, while the main bunch was at two minutes 15 seconds. Brennan found it difficult to keep pace and slipped back from the chasers. Sparrow also slipped back, with Mitchell continuing alone. However Samuel Tillett (Wales Racing Academy - National Team) and Kieran Regan (Dublin Friends First St Tiernan's) jumped away from the peloton and got across to Brennan and Sparrow, with this quartet joining up again with Mitchell. The five riders were two minutes and ten seconds back after 76 kilometres of racing, while the peloton was a considerable three minutes and 55 seconds down. The latter advantage saw Lavery become race leader on the road: he had started the day two minutes and 33 seconds back in 36th place overall. The pendulum started to swing after this point, with the chasers knocking five seconds off their deficit over the next four kilometres, and the peloton 25 seconds. The ebb continued and at kilometre 85, the chasers were two minutes back and the peloton at three minutes 15. Sensing a chance to gain time, five riders attacked the peloton. Darnell Moore (Ireland National Team), Sean McKenna (Ireland Holdsworth Pro Racing Team), Conn McDunphy (Ireland Holdsworth Pro Racing Team), Christopher Reilly (Cycling Leinster) and Dillon Corkery (Dublin Team Gerard DHL) combined to get within two minutes and 25 seconds of the break, but their surge also caused the bunch to accelerate and they were caught. After 93 kilometres, the five chasers were at one minute 40 seconds and the peloton at two minutes 35. However that downward trend was reversed after that, with the chasers losing eight seconds to the break over the next three kilometres and the bunch conceding 33 seconds. The eight leaders became seven on the day’s first King of the Mountains climb when Brennan slipped backwards. Castillo Soto was first to the top of Byrnesgrove (category 3, km 108.7), with Tillett, O’Malley and Turner next over the prime line. With 111 kilometres covered for the break, Eoin O'Connell (Cork Blarney RC) attacked from the bunch and was two minutes and 20 seconds back. The peloton was a further ten seconds behind. Soon afterwards, Louis Rose-Davies (Britain Canyon Eisberg) and Adriaan Janssen (Netherlands Delta Cycling X) jumped across the gap to O’Connell. However the trio were caught with 117 kilometres on the clock, just after Castillo Soto beat Tillett, Turner and Potts for the prime atop Castlecomer. The Mexican rider was on a mission and beat Turner, Lavery and Potts to the top of the day’s category one climb, that of Gorteen (km 120.9). O’Malley was getting into difficulty and lost his place in the group, leaving six riders out front. Castillo Soto was also best on the category two climb of Coan West (km 124.6), with Ryan second, Lavery third and Turner fourth. With 25 kilometres to go, the six leaders were one minute ahead of the bunch. Castillo Soto was riding into the mountains jersey and took the day’s final KOM prime atop the category two climb of Clongrennan (km 133.5). Potts, Ryan and Lavery were next there. After that climb, Downing and Lavery pushed ahead of the rest of the break. Potts got across to them, while the peloton was just 30 seconds back. Castillo Sotto and Ryan were still in between break and bunch and got back up to the leaders, making it five leaders trying to hold off the peloton. With about 12 kilometres remaining, Cameron Jeffers (Britain Saint Piran Elite Cycling Team) and Daniel Bichlmann (Germany Bike Aid) tried to bridge to the leaders but, after about two kilometres, the yellow jersey group dragged them back. The leaders still had 34 seconds at that point, but the advantage began to crumble and they were caught inside the final three kilometres. 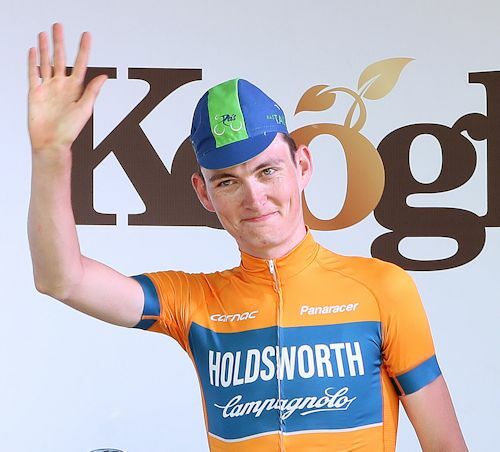 McKenna had expected to lead out other riders from the Ireland Holdsworth Pro Racing squad, but a gap opened behind him and he proved best in the tailwind gallop to the line. Claudio Imhof (Switzerland National Team), Luuc Bugter (Netherlands Delta Cycling X), Rens Tulner (Netherlands Delta Cycling X) and Marc Potts (Ireland National Team) took second through fifth, while Matteo Cigala (Westmeath Viner-Caremark - Pactimo) was sixth and again won the best county rider award. Stage seven from Carlow to Naas is one of the most difficult of the race, if not the toughest. The 141 kilometre leg through Wicklow is dotted with eight climbs. These are Ballythomas Hill (category two), Mondlea, Annagh Gap and Cronebeg (all category three), Garrymore (category two), Drumgoff, Wicklow Gap (both category one) and then the third category Slieve Cruagh.